Akrotiri is getting a reprint! Well this is lovely news! 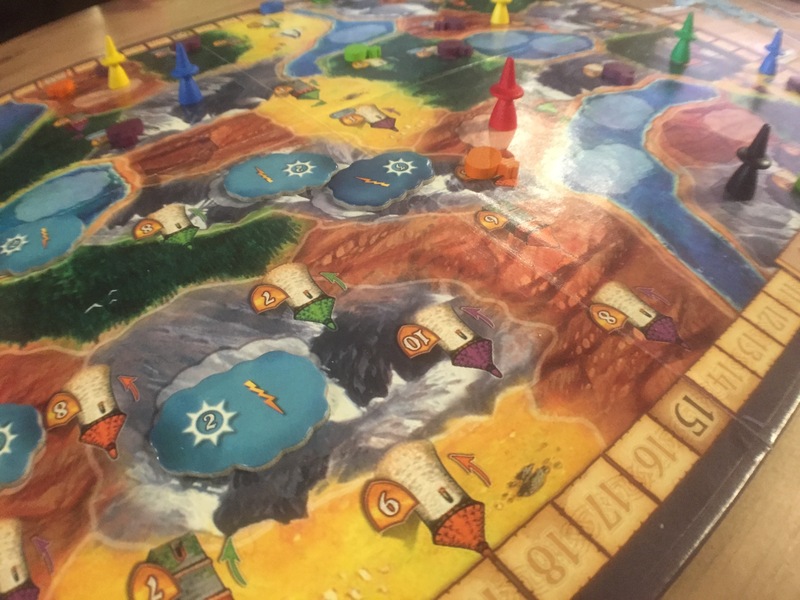 We heard from Filosofia, the publisher of Akrotiri that they are completely sold out of Akrotiri – but the orders from game stores keep pouring in – so another print run has been ordered! That’s fantastic news! No news on when it should be available, but if you want the game, keep bugging your friendly local game stores! Well, 10 days of gaming heaven has come and gone! 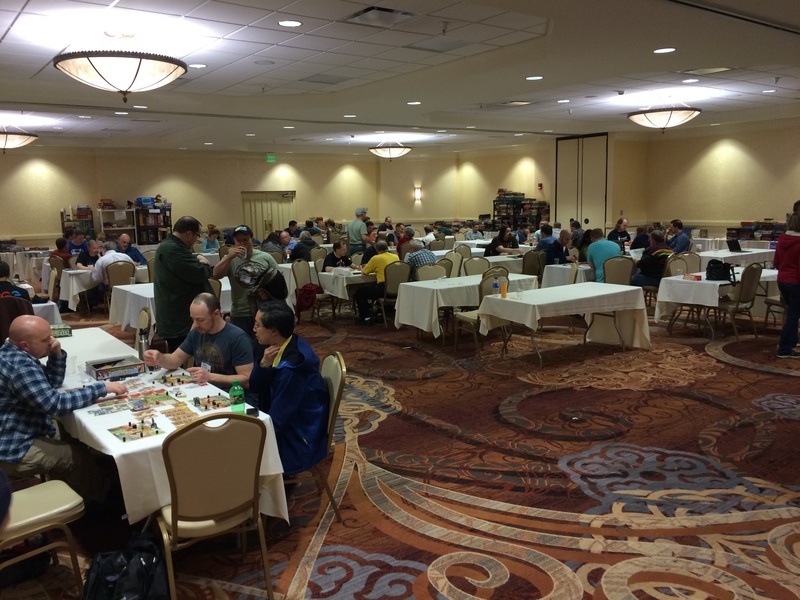 Alan Moon’s Gathering of Friends is an invite-only gaming event full of gamers, designers and publishers. 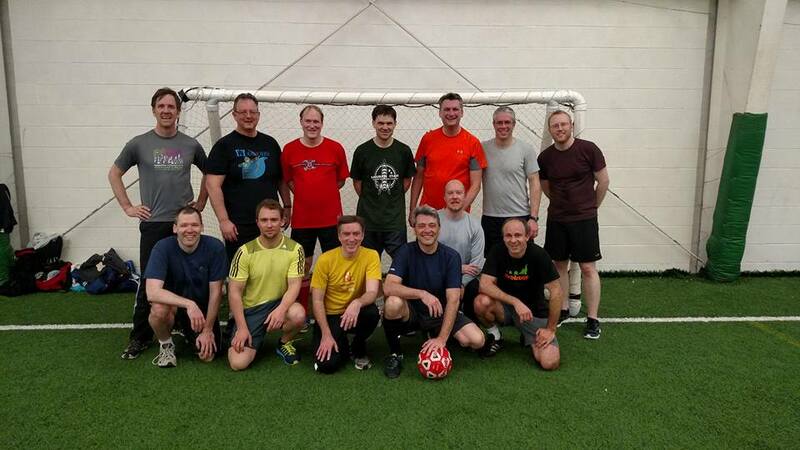 It’s my favourite 10 days of the year as I get to hang out with friends old and new – and play a bunch of games! 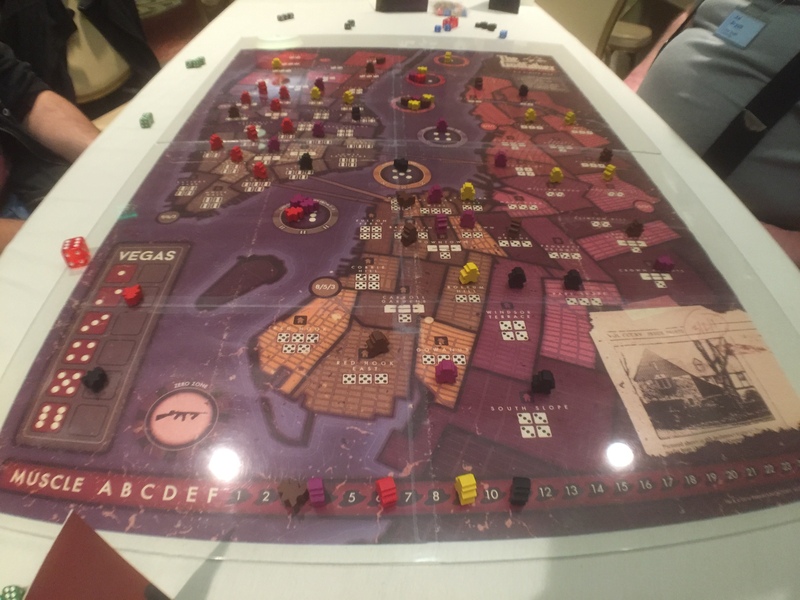 I’ll split this into two posts – one about the games we pitched to publishers and then a second one about the games we played. 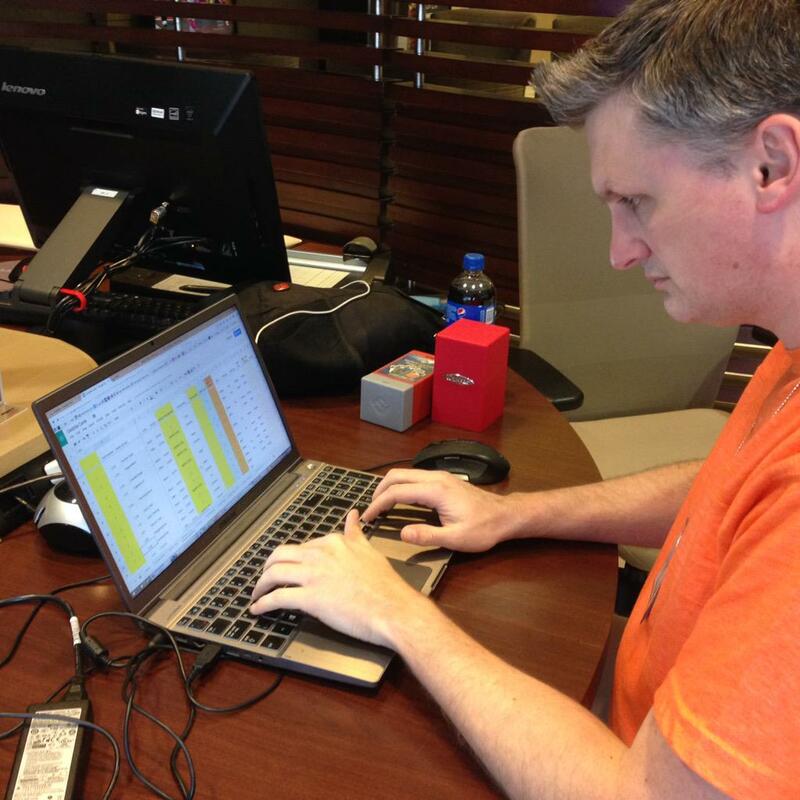 Jay working on Godzilla spreadsheets…fun! Sen and I are in a bit of a lucky spot since many of our games have been picked up, which means we didn’t have a lot of new game to pitch. This meant that we had more time to work on games that were already signed while we were together. We must have spent at least 3 hours a day working on Godzilla which is due out later this year from Toy Vault. Our first pitch was to the German publisher, Huch & Friends. Their representative is Britta, who last year took a couple of our games back with her. One was called Herdables and since we didn’t have any other plans for that game, we let her sit on that one all year. Well she brought good news with her as she said that everyone at Huch & Friends likes the game, and they’re now only trying to figure out how to manufacture it. They’re thinking of going with super thick cardboard instead of wooden tokens. Cool by us! Then we pitched our game called Chrono Chicken. 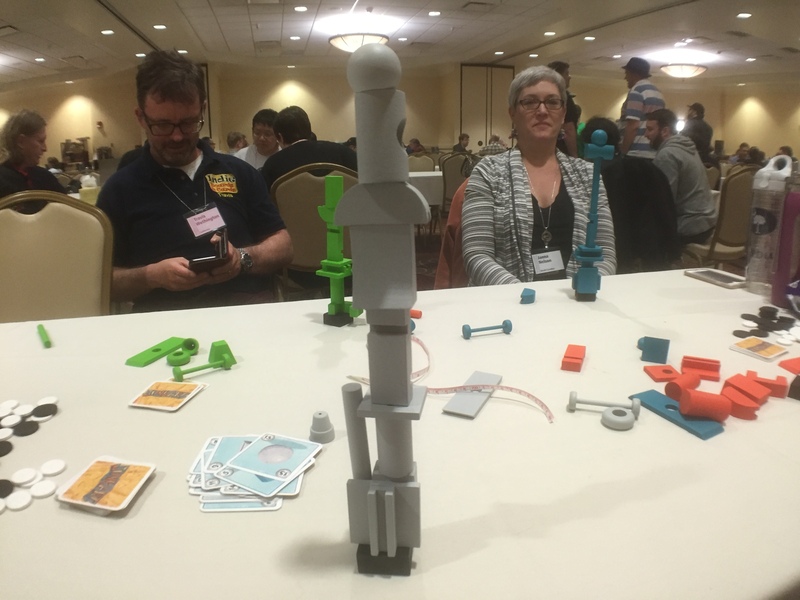 Ok – dumb name…so dumb that we didn’t even tell her the name of the game when we pitched it! It started as a game called Coaster Quest as it used actual drink coasters to play the game. But, as usual, the game changed drastically from its inception and instead of coaster it now used these cool two-dial secret spinners. We played the game – in which players secretly choose a number from one of the tokens on the table – by using their secret dials. She really liked it – and started talking in German with her cohort from Huch & Friends (dang – I forget his name!). They brought out their Huch catalogue and indicated a game that they have coming out later this year called Gum Gum Machine – a steam punk game about gum ball machines. She said that our game might make a good companion to that game – maybe call it Gum Gum Mini! So she agreed to take that game back to assess further. Then I pitched my first solo design to her. Now, I pitched this game to her last year when it went by the horrendous title, Ingnotus (Latin for unknown). She liked it last year but after assessing it she said that they couldn’t think of a theme for it (I had submitted it as a pure abstract game). So I worked on it this year and I came up with a theme. 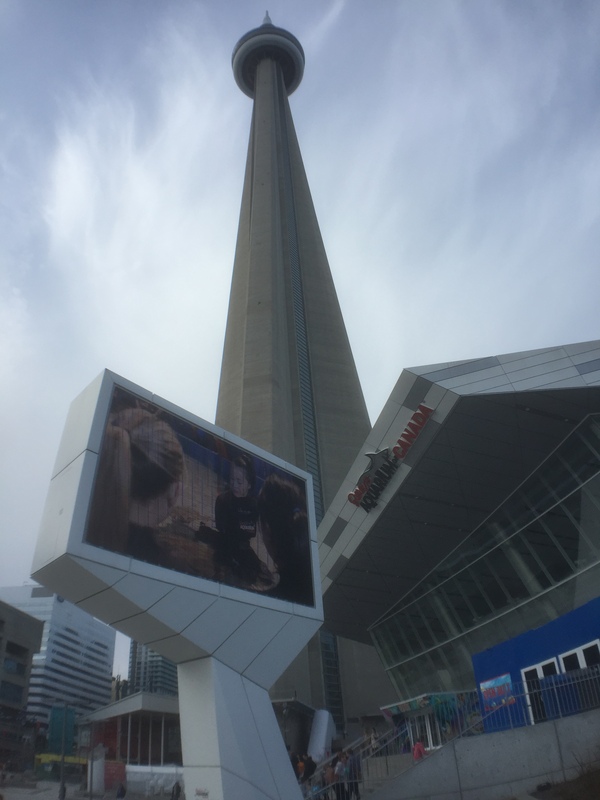 In doing so the game changed a lot – for the better! It’s now called The Mystery of Mister E (Now that’s a cool title – finally!). We played the game and she liked it a lot more than the previous version. She took that game back as well. Huzzah! I was able to pitch to Martin from Filosofia / Z-Man, but not our games! 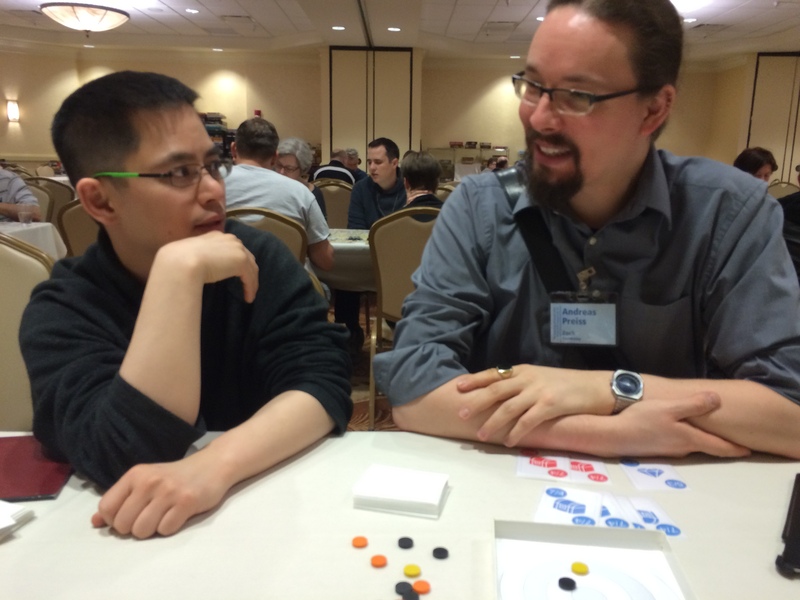 Instead I had two games from other Game Artisan designers that I wanted to show him. 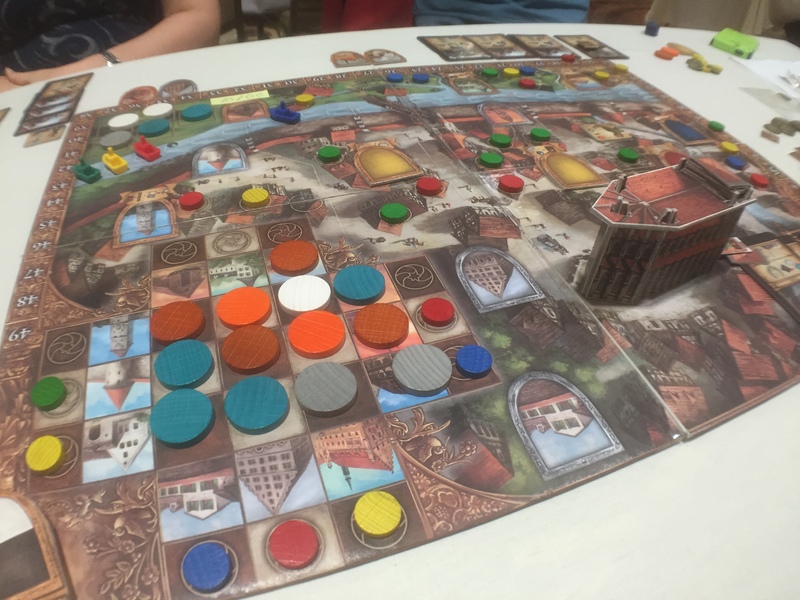 One was called City Builders: Rome from Andrei Filip – a co-operative Euro game that I only brought the sales sheet for him to see. He was interested and I have connected him with the designer. Then I showed him a quick reaction dice game called Joust from Graeme Jahns. He really thought it was unique and would like to see it again if he could figure out how to get the number of dice moulds down. We pitched to Zoch again this year, but we didn’t really have anything new! So instead we spent time talking about the kinds of games that Zoch is interested in and he let us know what they’re looking for – which included some IPs! We’re already working on them now! 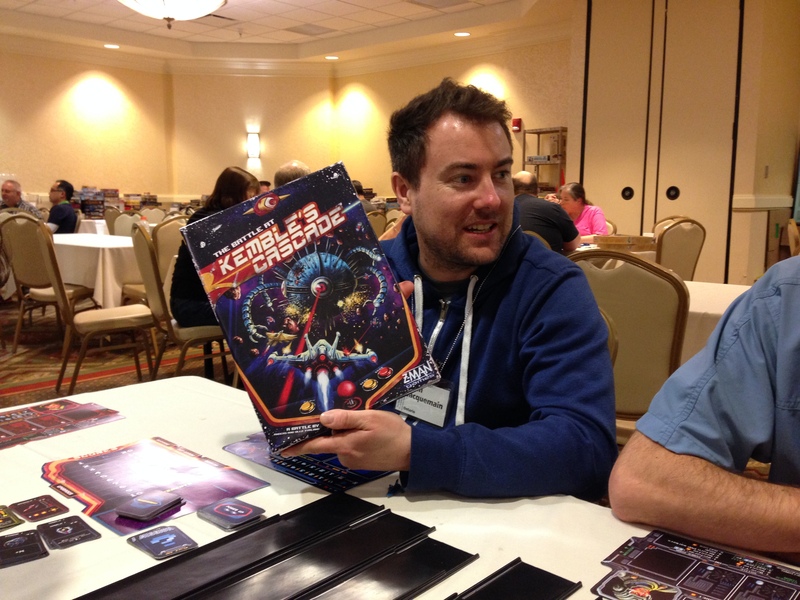 Playing Lions Share with Hasbro and Josh Cappel! Hasbro had a new representative and with it he brought a new way of thinking. He’s super interested in meeting with designers as he wants to create a network of designers that he can access when he needs them. He ran down how he wants to work with the Game Artisans of Canada in the future. He was excited to see that we had an organization across Canada as it will allow him to be super efficient. 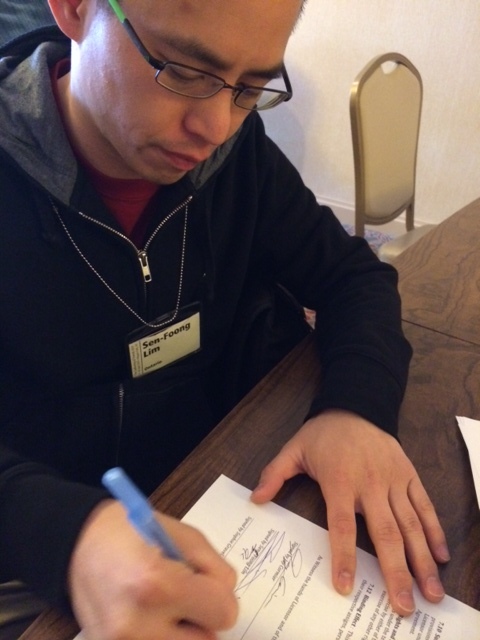 He’s planning on visiting us once or twice a year where only Game Artisans will be able to pitch games to him! Pretty awesome! We did end up pitching our game, Lions Share to him and he liked it, though we actually came across a game-breaking situation that had never happened before. Dang. Oh well – we know how to easily fix that in the future. Still – good to get in front if him and show him what we have. 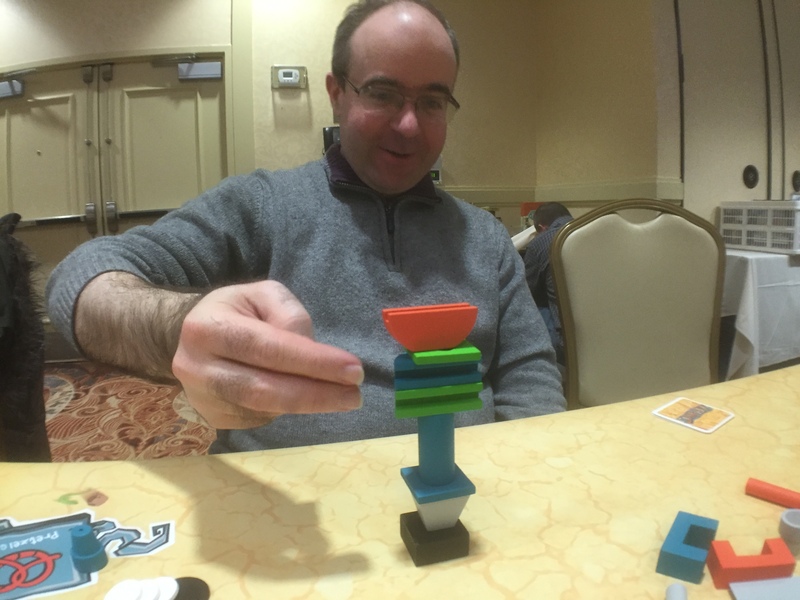 We had been working with Ed from Toy Vault all week – either on Godzilla (our upcoming card battle game) or a Naughty version of But Wait There’s More (we learned how to make this work!) 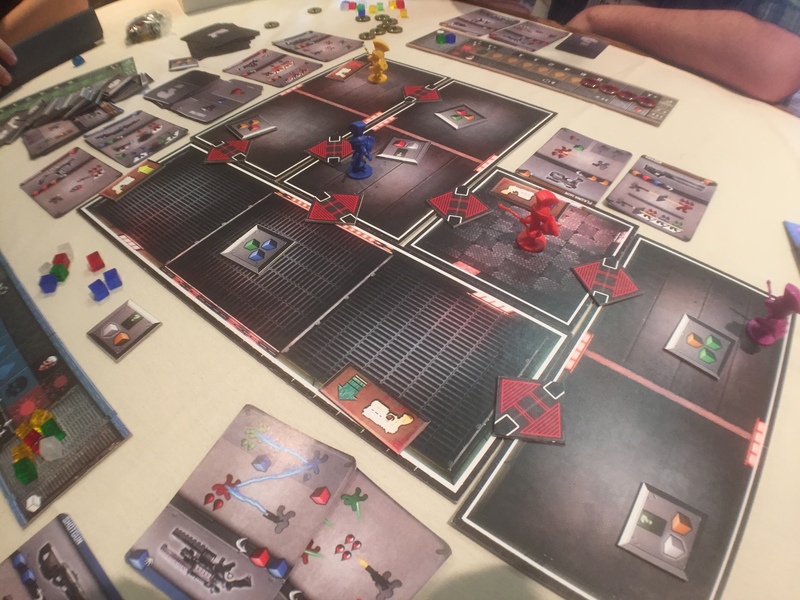 – but we finally had some time to pitch our revamped Firefly game to Ed as well. We showed it to him last year and he had some specific feedback so we addressed each of those requests and showed him the new version. The new version played out much better, but Ed had concerns that the new actions didn’t make it feel like Firefly. Before characters could only move into empty spaces, but now they can swap with other characters – which implies that they’re hiding behind each other and throwing each other into harm’s way. Not very Firefly! Then as we were packing up, we cam up with a totally new way to play that might allow it to fit with a more wacky license. The game played a lot faster and seemed to work fairly well actually. 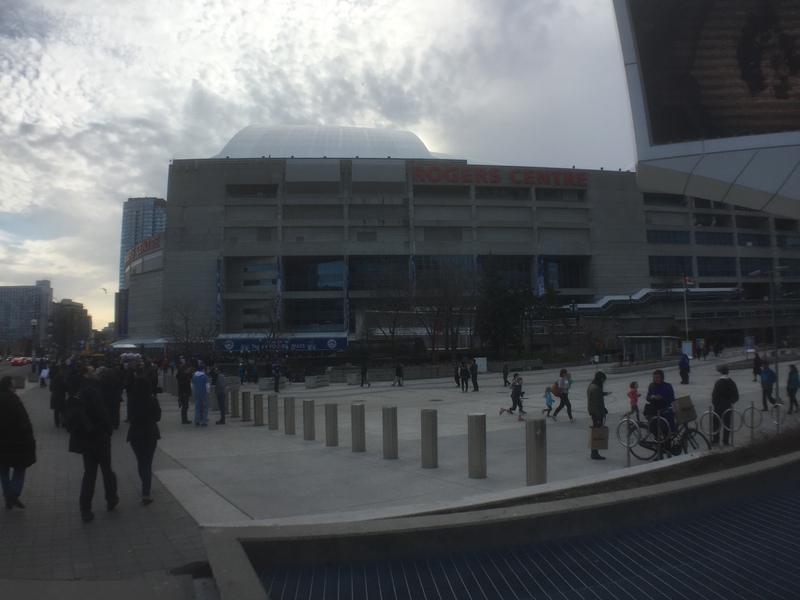 It was wild – quite the drastic change in gameplay and we managed to make it work. We’re now back to the drawing board with this one to see what theme works best with the mechanics. 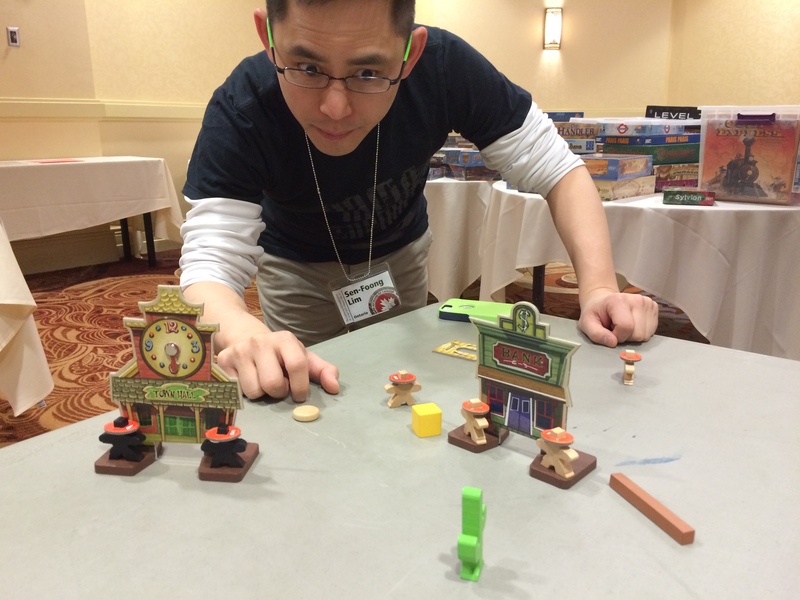 Sen lining up a shot in Flick ‘Em Up! There was a new game at the Gathering called Flick ‘Em Up, which is the first game in Z-man’s Pretzel line up. It’s called Pretzel because you can have a pretzel in one hand and still play! 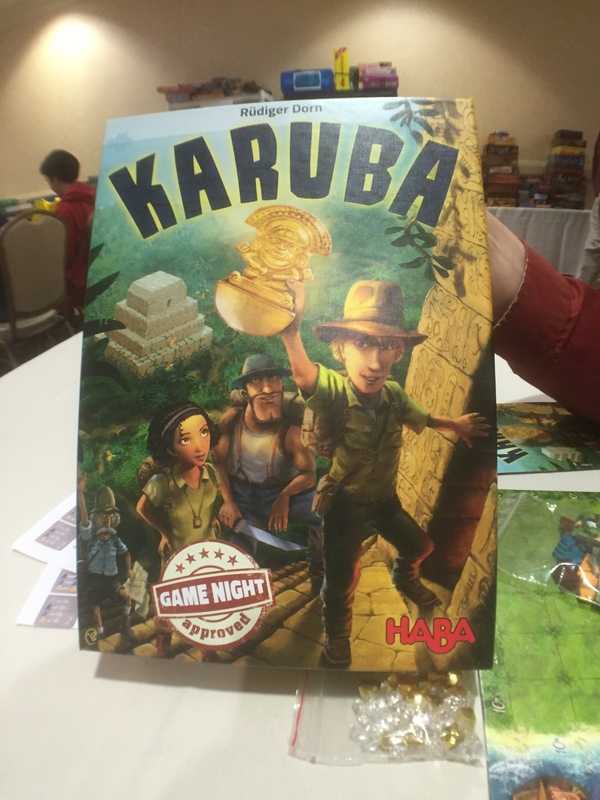 It’s a flicking game with cowboys and bad guys and it looks amazing! It comes with 10 scenarios which helps give the game a lot of flavour! We were happy to be asked to contribute a couple of scenarios to this game! Not just because the game is pretty darned cool – but because the second game in the Pretzel line up is one of ours – called Junkyard! That should be coming out next year! Finally we pitched Zombie Slam to Mercury. We had tweaked it since last year as we had feedback that it was super hard to stay human throughout the game. The new ideas worked a lot better and we had a human survivor win the game! They really seemed to like this game! Mercury is currently working on their first app-assisted game and then their second app-assisted game is actual designed by Sen, Stefan Alexander and me. So this would be their third app-assisted game. We all came up with even more ideas on how the app could work with this game and it got us all pretty excited about it! 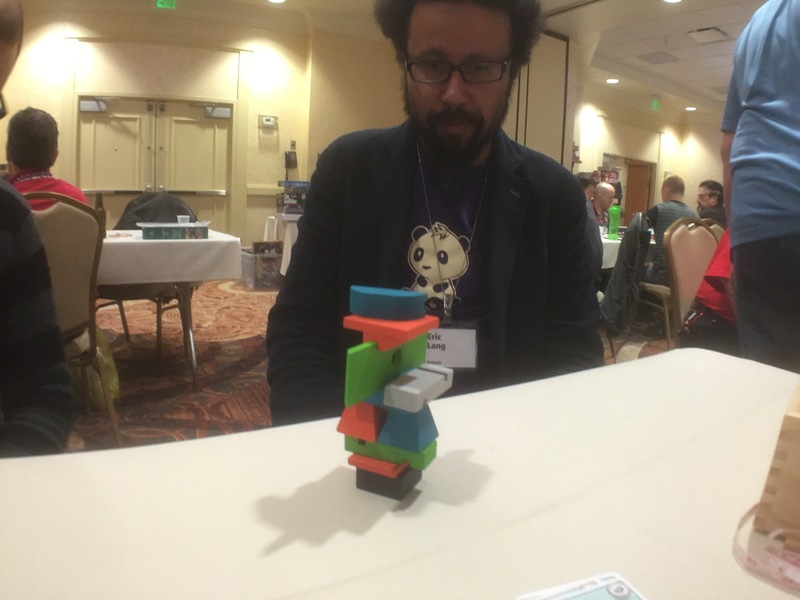 I ended the session by pitching a game I designed with Shad Miller called Q-Bot. 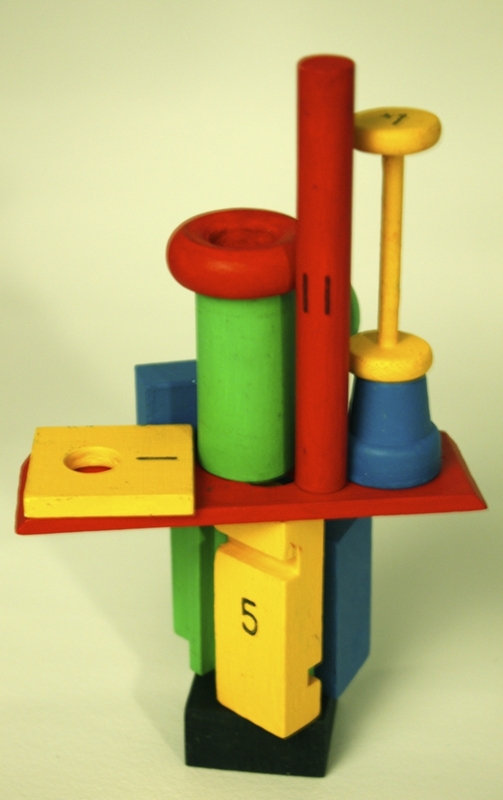 I knew it wasn’t really the kind of game they publish as it was an abstract game with wooden cubes. They liked it better than last year’s version but that’s about it. Coincidentally, while we were at the Gathering we also had some phone meetings with Ad Magic who is considering publishing 1-5 of our games in the near future! More to come on that as it’s finalized! 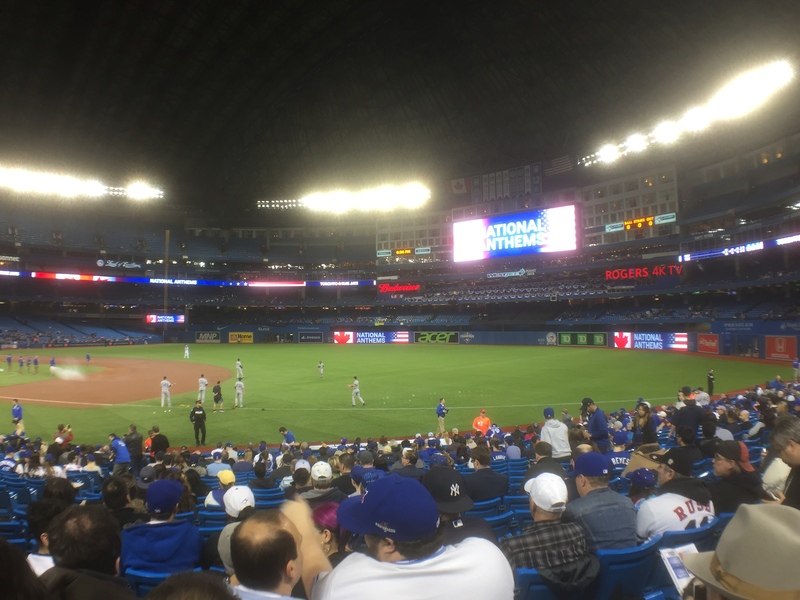 So all in all – an atypically quiet week for us on pitching games. I think it might be like that going forward because now we’re being asked to make specific games by publishers – and that takes time away from new designs. One day we’ll be able to quit our day jobs and focus on game design full time. That’s the goal at least! 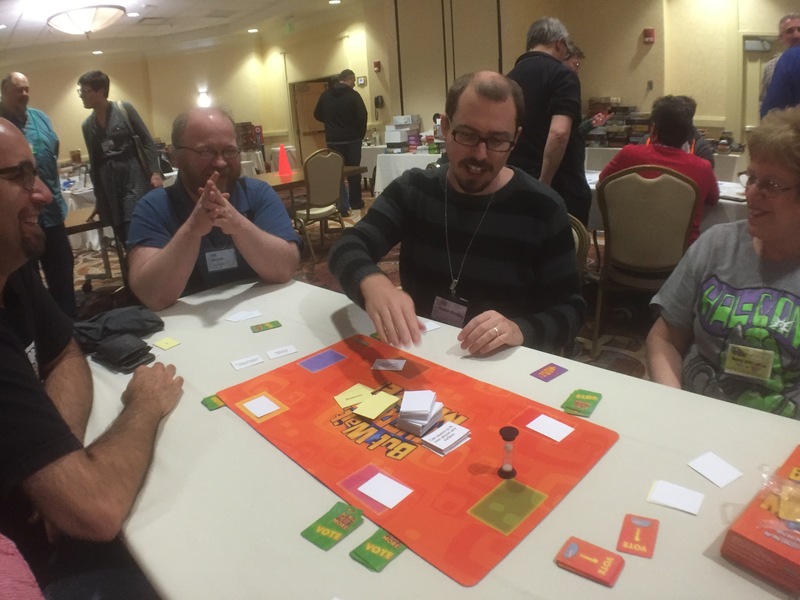 Next up I’ll review the games that I played at the Gathering – from new and existing games to upcoming unreleased games from prolific designers! 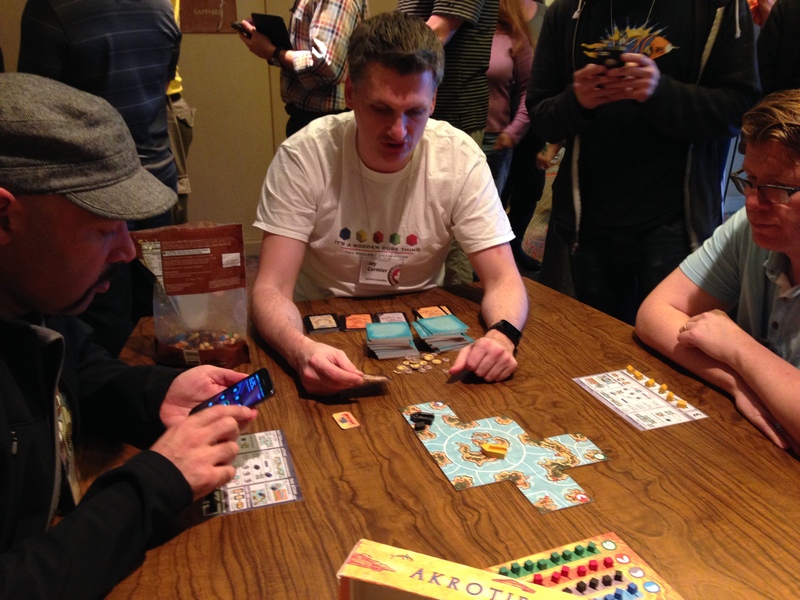 Akrotiri overview video from Essen! 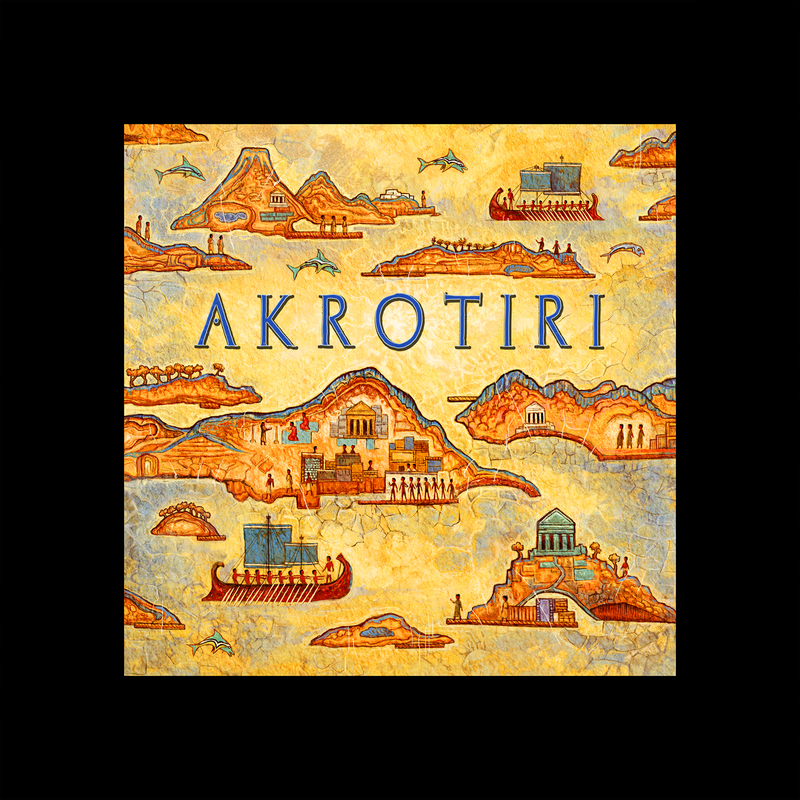 Our first game to be released at Essen Spiel is Akrotiri and we have our first video overview of the game thanks to boardgamegeek’s livestream! Click on this link and then jump to the 7:14:00 mark right near the end to watch this 5 minute overview of the game! Thanks to JF from Filosofia for presenting it so nicely! 1) It lets you see which publisher is more interested in your game.The more interested they are, the more likely they will want to publish it! 2) It lets you assess which publisher you’d rather work with for your game. Do you want your game to go back with a first time publisher or an established publisher? They both have their benefits – but you now get to make that choice! 3) Once you give it to one publisher, but more than one are interested, well now you know which publisher you can send it to next if that first publisher decides to pass on your game. It’s great having a line-up of publishers wanting to take a closer look at your game! Unfortunately for What’s That, the app kept crashing – sometimes right when we wanted to see what the answer was! It was frustrating – but it was a new app, made by fellow Game Artisan of Canada member, Stefan Alexander.We didn’t have much time for QA so we just went with what we had. I think the problem was that if I received a text message while we were playing then it crashed. I think they weren’t really interested in it anyway…! Next up was Pop Goes the Weasel.They thought it was too confusing for kids. 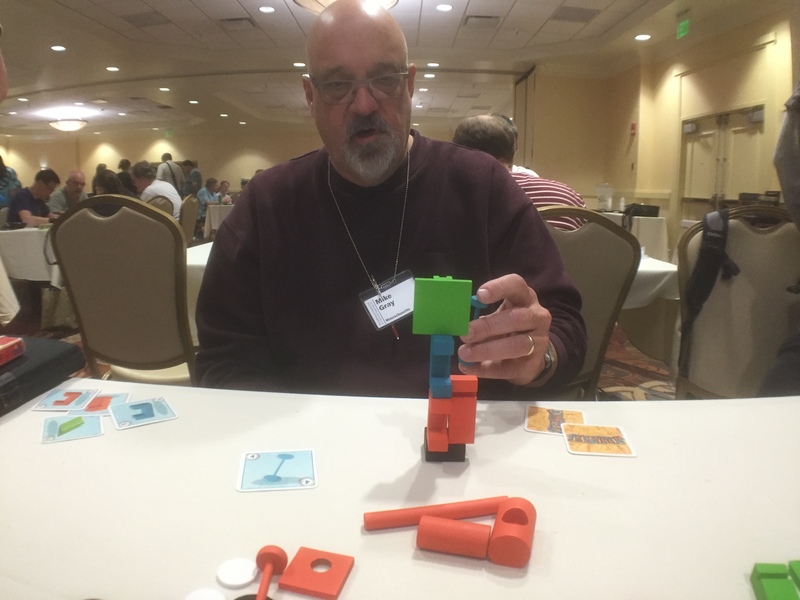 We did come up with one good idea that simplifies the game for kids, but still retains the ability to play the game as is for slightly older kids. 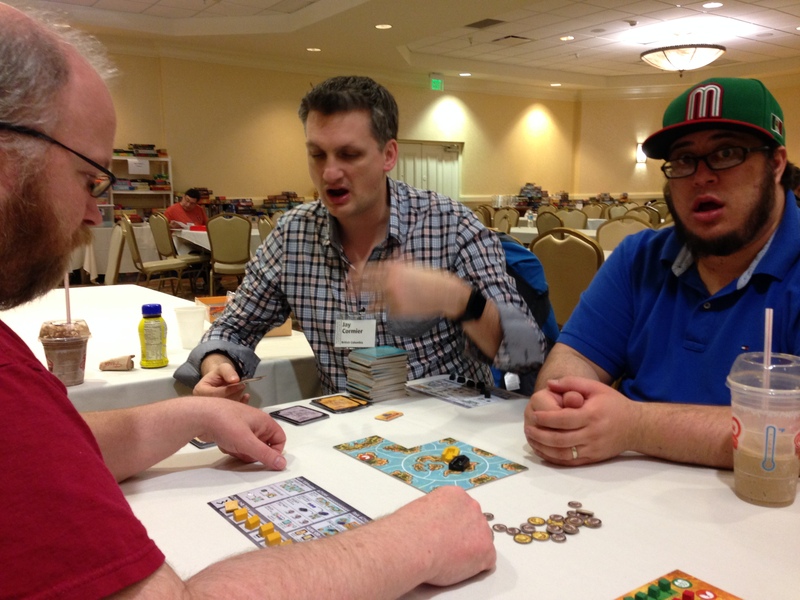 By this point I had Josh Cappel (artist extraordinaire of such board games of…oh I don’t know…Belfort!) joined us so we pitched our new game, Rock, Paper, Wizards to JF. Yep – Josh joined forces with the Bamboozle Brothers and the three of us created a brand new game! 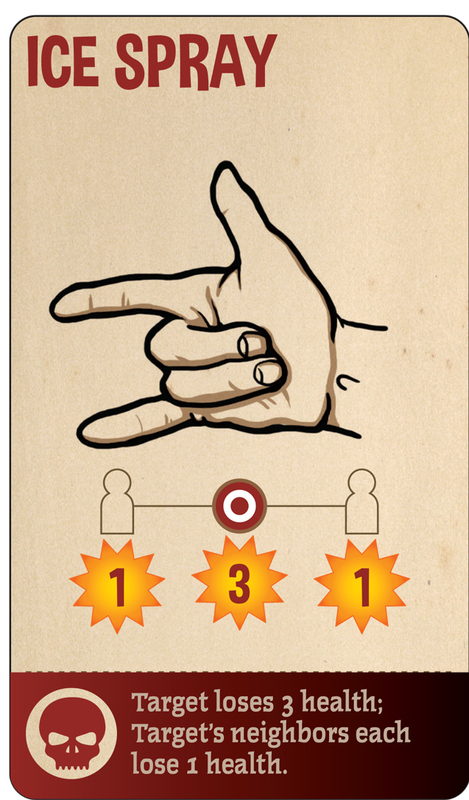 It involves bluffing and pointing weird finger gestures at other players! 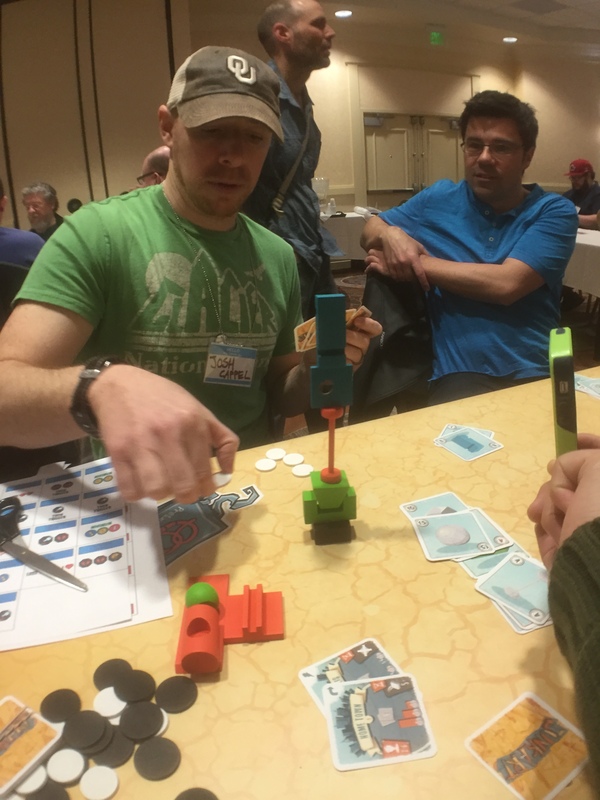 Ed Bryan from Toy Vault also came by and helped us playtest this one. Ed’s another good wingman for me! The game went so well that he brought Zev over to play it. Zev IS Z-Man Games, but Z-Man Games is owned by Filosofia. Zev liked it a lot and wanted to make sure they took this one back with them. Yay! Two games now being requested by publishers! Update: We have received an email from Filosofia after they played it and they said that while they don’t want to publish it as is – they don’t want to give it back to us. They had some concerns and asked us to see if we could review some options. So we are! 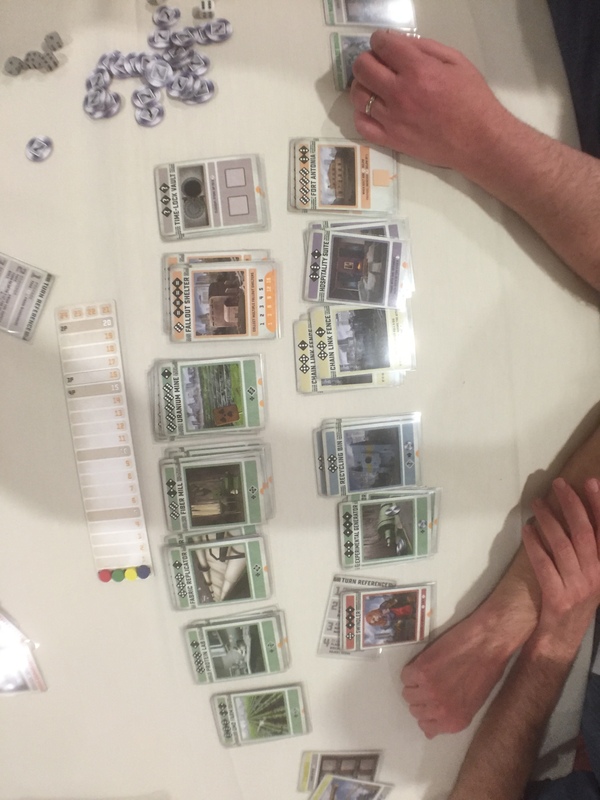 We were then told that they did get the new sample of our game Junkyard from the manufacturer’s in China. 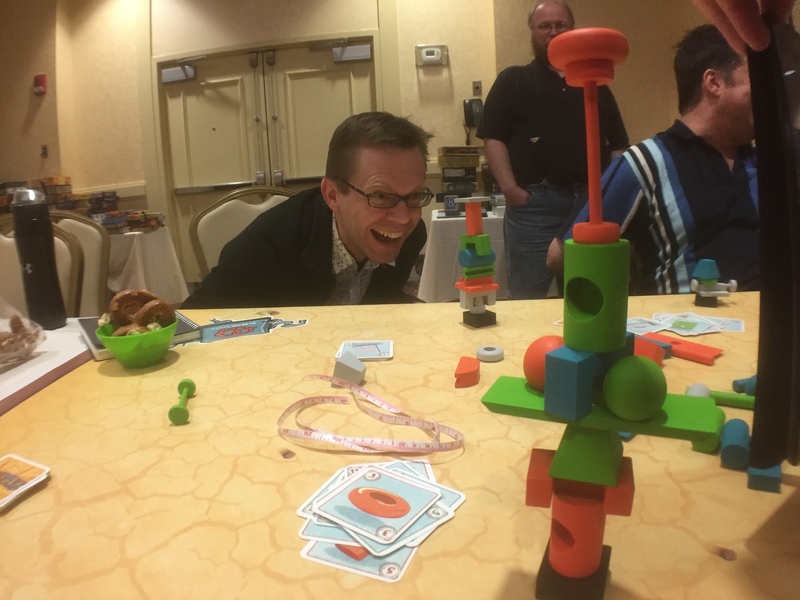 Last year at the Gathering I showed them Junkyard and since then we’ve been figuring out a way to make the game. Everyone at Filosofia loves the game, but the cost to produce 52 wooden pieces is high.When I visited Filosofia in November we came up with some ideas on how to reduce costs.The biggest idea was to reduce the size of the pieces by 20-25%.We got a quote from Panda on how many we’d have to make in order to get the per unit price low enough to retail it for $30-35.The pricing and quantity worked out for Filosofia, but they wanted to see a sample of the product before committing.They brought this sample and we got to play the game with Zev because he has never played Junkyard.After a fun game of Junkyard Zev gave his thumbs up to the game. So this meant that everyone is on board! The next step for Junkyard is to ask for another sample with a varnished finish of some sort as the pieces are a bit too rough as they are now. But yay for progress! 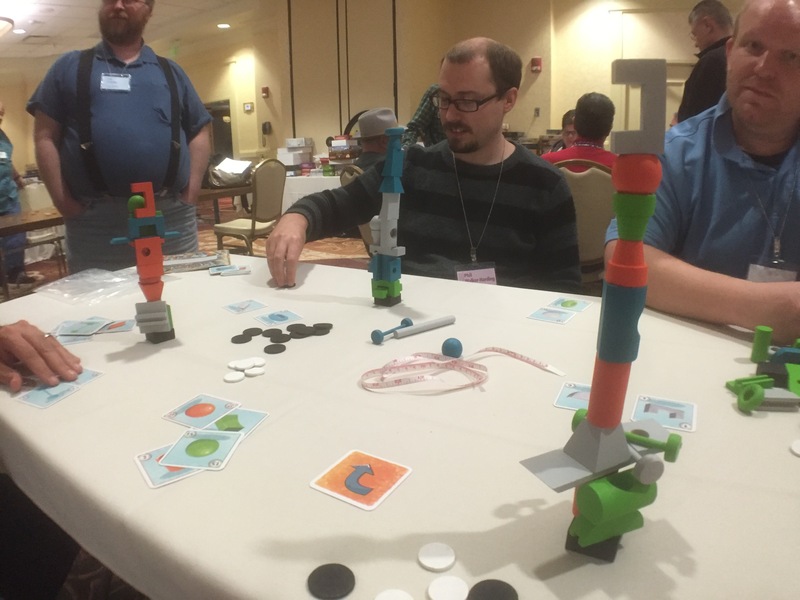 We were also given feedback on the three other games that Filosofia had since November. Jam Slam was one of them that showed the most promise so JF wanted Sofie to play it. I learned something about pitching in this pitch session. The game is a simple game of listening to a clue and slapping a card that has that information. For older kids it has an advanced variant where you get bonuses if you collect the most or least of a specific thing. I thought we should play with this since we’re all adults and it would make it more of a challenge – and therefore (in my mind) – more fun.Well that was wrong. Being new to the game, Sofie was confused by the multiple motivations. She boiled it down to show that the game had three motivations and a kid’s game should only have one motivation. So the lesson learned is to always show your game as the base concept first, before throwing in variants or expansions! So she decided to pass on it but gave us some interesting insight into the design. 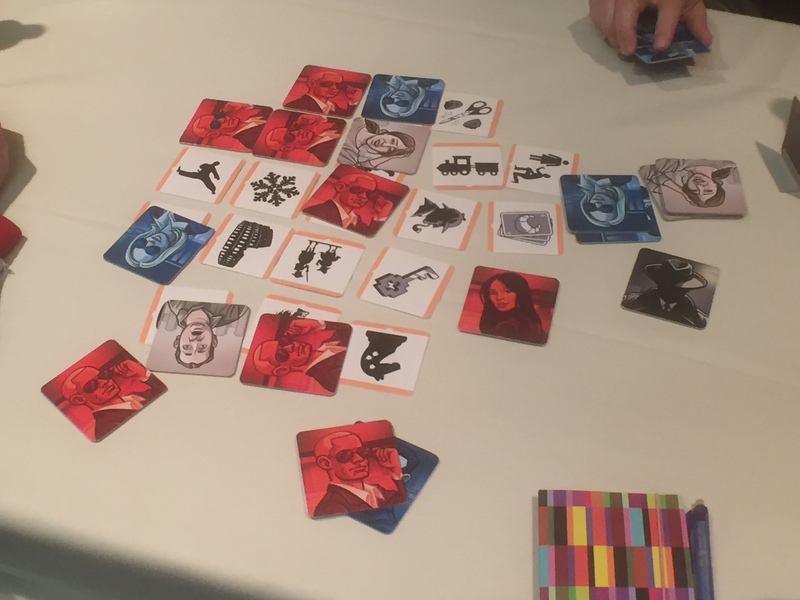 JF also shared some comments from the playtests of the other two games they had of ours and from this we learned another lesson.The feedback for our card game, Lion’s Share was that there was fun there – but there was too much memory in it.Wait – what? Memory? There’s no memory at all in the game.Why would they say that then? Think about it for a second…..yep – they played the game wrong.And who’s fault is that? Ours.We re-read the rules and found a section that could be misinterpreted. Damn. Sometimes you have only one chance with a publisher and if the reason why your game fails is because they played it incorrectly, then you’re hooped! By playing incorrectly, they didn’t get the experience you wanted them to have so they only thought the game was mediocre.When you found out they played it wrong, there’s little motivation for them to play again because their experience was only mediocre before. 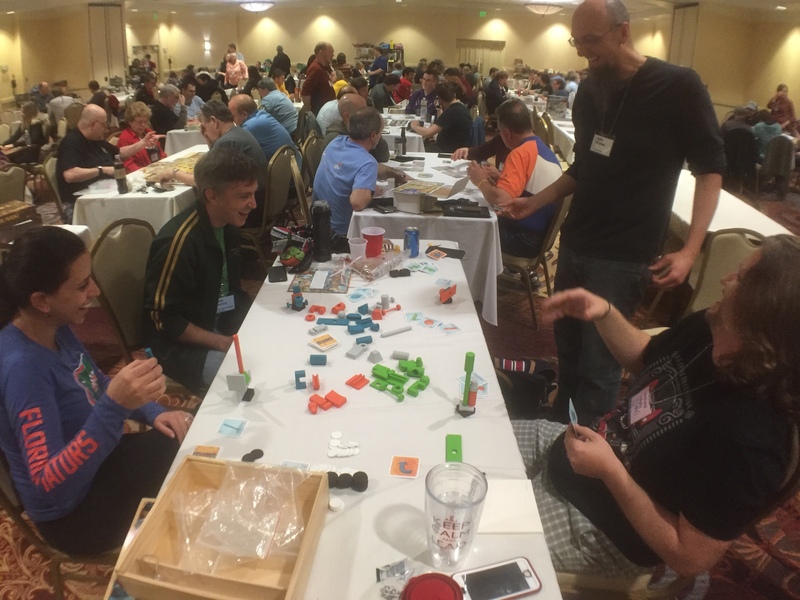 So the lesson here – blind playtest your game! 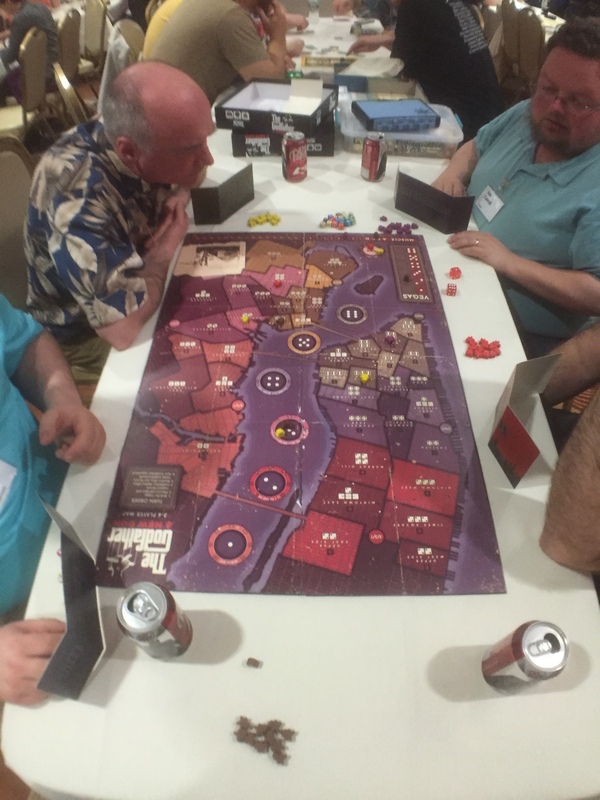 Have some other group playtest your game without you there to guide them or help them out.This will help you ensure your rules are being interpreted correctly. Whew! That was a busy first day! And there are still more pitches ahead – so stay tuned! Sen and I designed a game called Santorini. 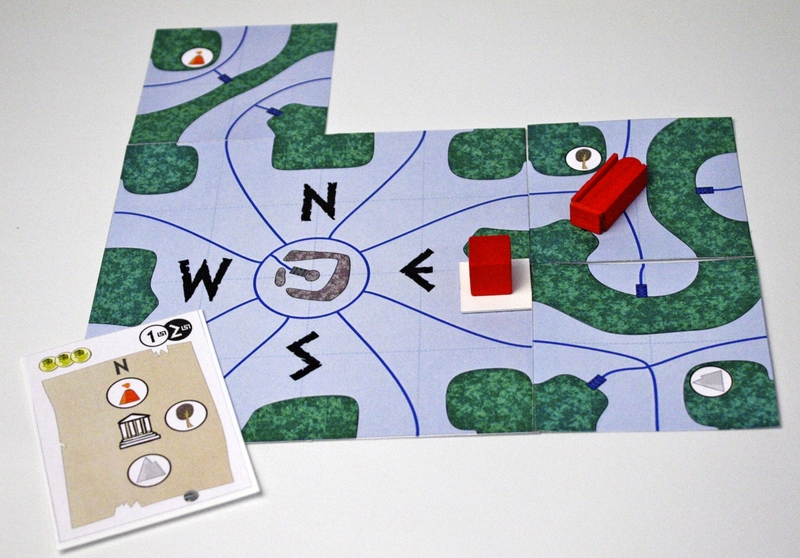 It’s a tile laying exploration game that has a pretty clever new mechanic that’s used to find hidden temples. Once we got it to a point where we wanted to show publishers, another game designer pointed out that there was already a game out there called Santorini – by a fellow Game Artisan of Canada no less (we were just new to that wonderful group of game designers at the time). So we were a bit bummed because that was a cool title. We did some more research and found that the name of an archaeological dig site on Santorini is Akrotiri. We liked it and that became our new title for the game. The game made it to the finals of the Canadian Game Design of the Year and the first publisher I showed it to was Zev from Z-Man games. 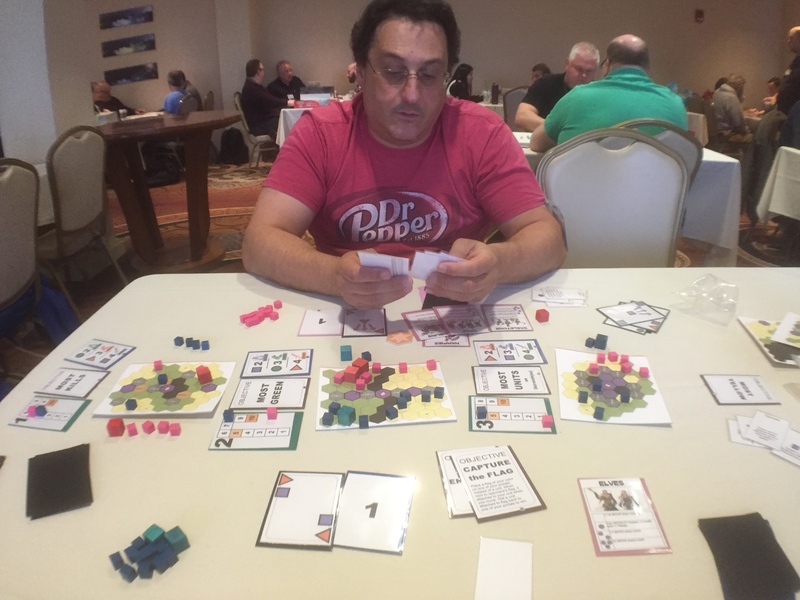 I was at BGG.con (a convention in Dallas that’s run by http://www.boardgamegeek.com) and I only had time for a 5 minute pitch. He liked it enough to want to investigate it further. Then the waiting came. We kept prodding with emails asking about their thoughts and kept waiting to hear from them. Then a few months pass and Filosofia acquires Z-Man Games! So now there’s a whole whack of time that passes as they figure out their new structure and who’s doing what. We do get word from Zev that the people at Filosofia like the game though – so that’s good! In the middle of all this, Quined expresses interest in checking it out. We get permission from Z-Man to show it to them (very important! Never show your game to more than one publisher at a time without their knowledge!). They play it and like it, but they don’t like the ending. We explore some other options and we scrap the entire ending we had and find something that feels a lot more organic and obvious. In the end, Quined passes because it’s not heavy enough for them. But we’re happy because we have a new version that plays even better than the old one! We share this with Z-Man Games. More time passes and I attend the Gathering of Friends last year for the first time. I had connected with Sophie from Filosofia before attending and we agreed that it would be a good place to play it together and come to some sort of agreement. We played a 5 player game of Akrotiri (tip: unless your game plays best with 5 players, always choose to play with fewer!!). Like most tile-laying games, a lot can change before it’s your turn, so Sophia thought that she had to wait until it was her turn to pay attention. Not good. But she thought the game would be a good 2 player game…! 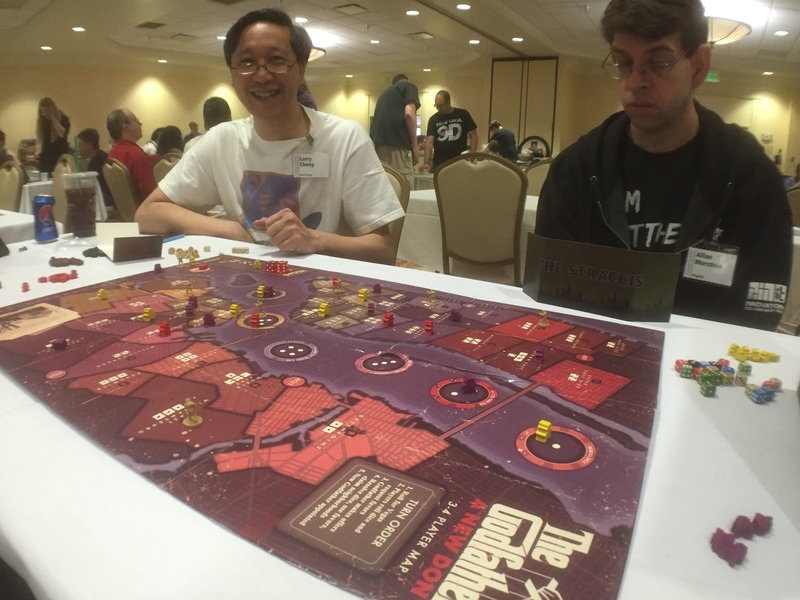 They took the game back with them and tried it a few more times as a 2 player only game – and they liked it! They wanted to do it! Huzzah! They wrote up a contract and sent it to us – and we signed it and sent it back….but it still was never 100% official until this week. Why? 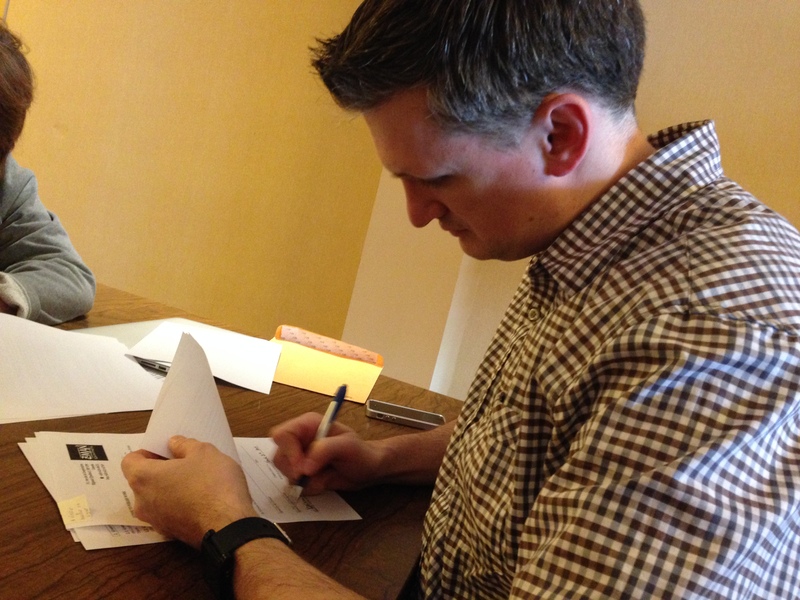 Because we got back the signed contract – with their signatures on it too! 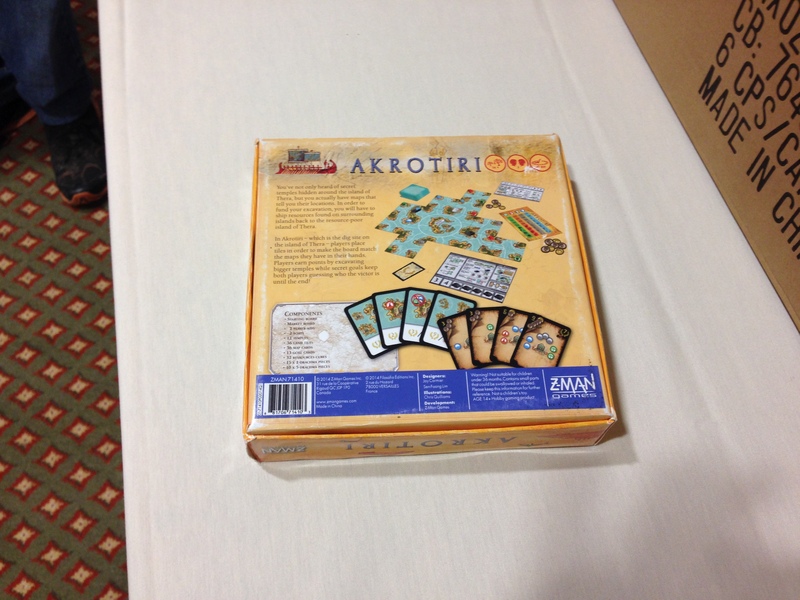 So now Akrotiri is happening! It will be a 2 player game, in the same box as the Agricola 2 player game. We’re not sure exactly when it’s coming out, but the artist (the amazing Chris Quilliams!! Check out his stuff!) has already been in contact with us to ask us questions about our thoughts on things like time period and whatnot. Super cool! So three cheers! We’re super pumped to partner with Z-Man Games on this! We’ll share more news about potential release date as soon as we know more.